Following the bombing of London, during World War II, a massive clearance and rebuild was begun. It was during the excavations in the Walbrook area that the Temple of Mithras was first uncovered, in 1954. Between 1961-2 the temple was dismantled and moved roughly 100 metres, to Queen Victoria Street, where it was rebuilt. Unfortunately, the rebuild resulted in the temple becoming a mish-mash of bricks, put together with modern materials. In 2011, with the entire area being redeveloped, the temple was again dismantled, with each ancient piece being cleaned, before it was reassembled on its original site, beneath the new European Headquarters of Bloomberg. For a small venue there is a wealth of information, spread across three floors. The entrance hall has a floor to ceiling glass display case, with artefacts that were discovered in the area where the Temple of Mithras was discovered, back in 1954. Descending the stairs, the walls of which are covered in slate, give a timeline of London. The next level has projected images with a soundtrack, voiced by Joanna Lumley, giving an insight into the belief in Mithras. There are also resin casts of the layout of the temple, the Tauroctony and the head of Mithras. Each of these has touchscreen display, which gives a wealth of information about each piece. 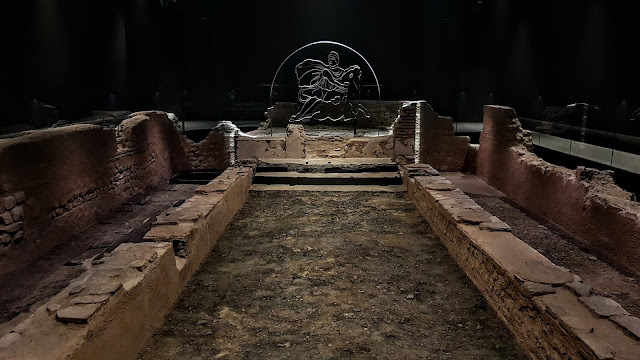 Down another flight of stairs and you enter the Temple of Mithras, which has been lovingly, and painstakingly, rebuilt, with subtle lighting, sound and mist effects, which brings the temple to life. The staff are quite knowledgeable and try to answer any questions, that you might have. This should be on everyone's list of places to visit, but you must book in advance.